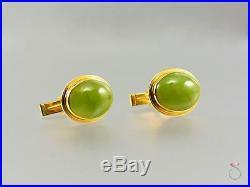 RARE GREEN JADE MING'S CUFF LINKS. 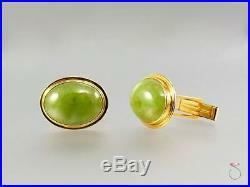 The beautiful pleasant green color of the jade pieces in contrast with the yellow gold make this pair of cuff links a class on its own. 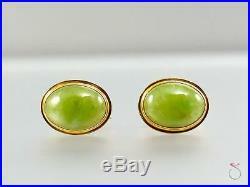 The two large cabochon jade pieces measure 20 mm long and 15 mm wide making this piece a real statement. The jades are bezel set in 14K yellow gold with a double rim, adding a beautiful modern yet timeless elegance to the piece. 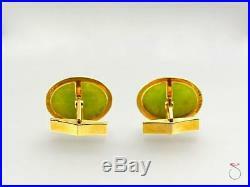 These cuff links are Hallmarked'Ming's" and Stamped "14K on the back. The cuff links mechanism is also in 14K yellow gold with a spring fold mechanism. 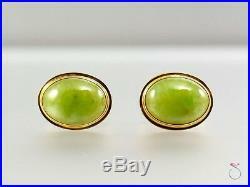 Gemstones: 2 Cabochon Green jades. Gram Weight: 17.00 Grams. Ming's Honolulu offered pieces in gold, sterling silver, pearls, jade, coral, and Ivory, depicting Hawaiian and Asian motifs and hand carved figures. Of flowers and natural objects. 14K pieces were marked HK and 14K. Cast or hand-wrought sterling pieces were stamped MING'S, and often signed with S/S for sterling silver. Ivory pieces were hand signed in black ink. Often with a description of the piece - such as Ming's Honolulu Ivory Plumeria Blossom. " The earliest ivory pieces were hand signed ". Wook Moon trained many carvers in the midcentury who went on to individual fame, including Isami Doi and John Roberts. The Honolulu location was the last store to close in 1999 and Ming's jewelry is now highly coveted by collectors and jewelry connoisseurs. We only sell very desirable, high quality, fine jewelry, estate jewelry, and fine watches building our excellent reputation by always telling the truth and offering great prices. You will find us to be straight forward and honest about the quality, conditions, type of metals and stones that are listed. Before proudly posting an item, we follow company procedures by first verify/grade all diamonds, gemstones and precious metals to be of the quality that is stated. Then, our jeweler will use professional tools to provide a slight to extreme cleaning/polishing depending on the piece. We take many photos of the actual item from many angles to help you see all of the details. A few of our antique/vintage/art deco pieces will be in the original untouched condition that so many of our clients love. This will be stated with the specification AS-IS. Due to calibration of computer monitors varying from computer to computer, color of gemstones or precious metal (and other elements of the pieces) may vary from the photos on the listing. Descriptive words such as "semi-translucent" "mottled" are the opinion of our in house gemologist, and are not grounds for a return. Colors are also interpretations of the gemologist. Motifs of carvings and designs of jewelry are the interpretation of our in house gemologist, and are not grounds for a return. Please view the photos carefully to make your own interpretation of designs. All watches are 100% authentic and are checked and/or serviced by Solitaire Jewelers' Certified watchmaker to insure it is keeping accurate time. Any customization or aftermarket parts such as "custom diamond dials, bezels, or bands" will be disclosed in the item description. Solitaire Jewelers Service Center, services and repairs Swiss Made watches and timepieces. The jade pieces that have been listed have all been tested to verify natural jade or jadeite by refractometer reading & magnification only. Please note this does not preclude the fact that some pieces could be dyed and or polymer treated and are stated as natural for the material only, but not for the type of treatment that requires a sophisticated spectrometer reading best provided by a laboratory. If it is verified that the jade has not been treated or enhanced, it will be noted in the listing description or a certificate may be provided. Some surface reaching inclusions may seem like cracks to the untrained eye, if a piece of jade is cracked or repaired this information will be disclosed in the item description. We will acid test gold items for items that are not stamped and will acid test stamped items on request. Please message us if you would like confirmation on gold karat. All items are described in details and all images are of the actual items. ALL ITEMS ARE 100% Authentic. We inspect and authenticate all items before listing and insure all our clients a pleasant shopping experience. We check our messages once a day, and would usually get back to you within 2 days. We take many photos of the actual item to show all / most details & do our best that the images represent the item properly. All items are described accurately, so please read the full description and ask all questions before purchasing an item. We only accept cancellation requests if there is an error in the listing. We are interested in your complete satisfaction and repeat business and do our best to get it right the first time! We ALWAYS will attempt to make things right. We carry nationally recognized exclusive luxury jewelry brands, vintage & antique jewelry, custom designs and Fine Swiss watches. Major buyers of fine jewelry and fine watches, gold, platinum palladium, silver coins, and bullion, specializing in large estate liquidation. We are large enough to serve all of our guests needs, but more importantly, small enough to deliver that service in a professional caring way. Please stop in or visit our SolitaireJewelers website to see designs by world renowned Jewelers, Fashion Houses and top watchmakers. Store Information and Hours of operation. Solitaire Bridal & Estate Jewellers. Listing and template services provided by inkFrog. 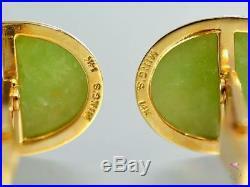 The item "MING'S HAWAII 14K YELLOW GOLD JADE CUFF LINKS. 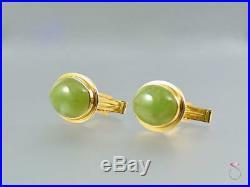 RARE GREEN JADE MING'S CUFF LINKS" is in sale since Monday, June 6, 2016. 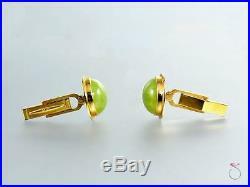 This item is in the category "Jewelry & Watches\Men's Jewelry\Cufflinks". The seller is "solitairejewelers" and is located in Honolulu, Hawaii. This item can be shipped to United States, United Kingdom, Denmark, Romania, Slovakia, Bulgaria, Czech republic, Finland, Hungary, Latvia, Lithuania, Malta, Estonia, Australia, Greece, Portugal, Cyprus, Slovenia, Japan, Sweden, South Korea, Indonesia, Thailand, Belgium, France, Hong Kong, Ireland, Netherlands, Poland, Spain, Italy, Germany, Austria, Israel, Mexico, New Zealand, Singapore, Norway, Saudi arabia, Ukraine, United arab emirates, Qatar, Bahrain, Croatia, Malaysia, Panama, Jamaica, Bahamas, Uruguay, Switzerland, Barbados, Bangladesh, Brunei darussalam, Bolivia, Egypt, Guadeloupe, Iceland, Jordan, Cambodia, Sri lanka, Luxembourg, Maldives, Nicaragua, Oman, Pakistan, Paraguay.